The Penticton Farmer’s Market continues to be one of my favorite summertime activities! The variety of goods sold at this market is always a bounty of the local fruits and vegetables, artists works, clever marketing, delicious foods to taste as well as wondrous ideas of creativity. Last weekend I attended with my faithful sidekick and neighbour, Debi. 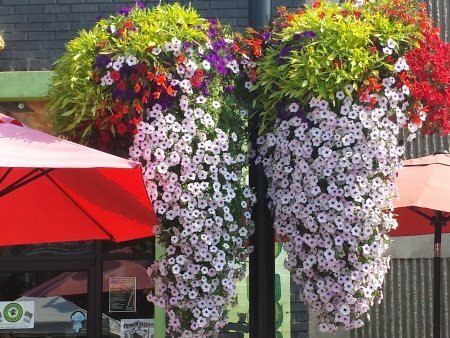 We were so impressed with the hanging flower baskets on Main Street, I just had to take a picture! Is this not a thing of beauty?? We could not figure out how they get these to grow so prolifically in this extreme heat… a wonder to behold. The Market runs every Saturday from 09h00 to 13h00 from May to October. Don’t miss out!